Beat Country Crock® Spread, granulated sugar and brown sugar in large bowl with electric mixer until light and fluffy, about 5 minutes. Beat in eggs, one at time, beating 30 seconds after each addition. Beat in flour mixture just until blended. Drop dough by heaping tablespoonfuls, 1-inch apart on prepared baking sheets. Bake 8 minutes or until tops are puffed and dry but still soft when touched. Cool 5 minutes on wire rack. Remove from sheets and cool completely. Microwave chocolate chips in small microwave-safe bowl at HIGH 20 seconds; stir. Repeat if needed to melt chocolate. Arrange 6 cookies on waxed-paper-lined baking pan, then drizzle with melted chocolate using a fork or spoon. 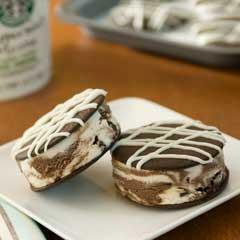 Scoop Breyers® Vanilla Fudge Twirl on 6 remaining cookies, then top with decorated cookies; smooth Ice Cream edges. Return sandwiches to freezer to set before serving.